Pride of ownership really shows in this beauty! Sellers have transformed nearly every inch and it is stunning! Freshly painted exterior! Gorgeous lake front lot with golf course views! 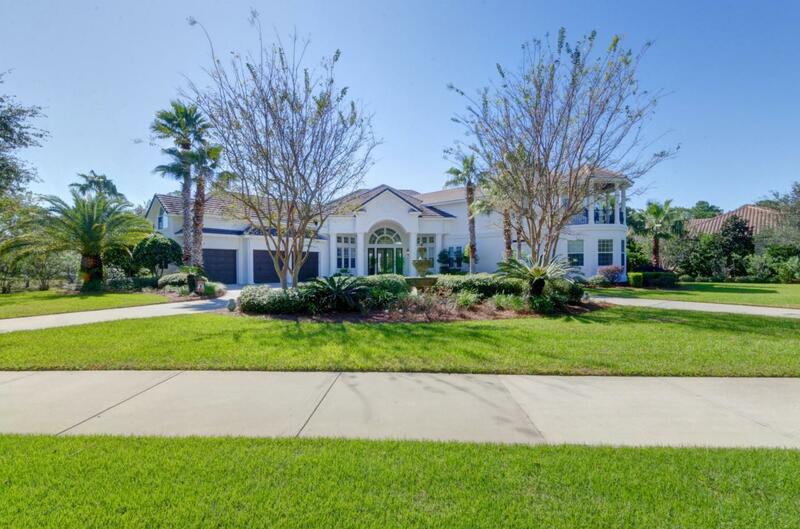 Fabulous curb appeal and entrance, with a circular drive and double entry doors leading into the great room featuring soaring ceilings, lots of natural light and the first of many views of the pool, lake and golf course. Adjoining is the open leisure room/kitchen/casual dining area, also offering great views, and a gas log fireplace. Fabulous kitchen, with upgraded stainless appliances and gorgeous quartz counter tops...this kitchen looks and feels like brand new! The grand master suite on the first level has a very spacious bedroom with sitting area, spa-inspired bath oyour dreams...with two separate vanities, private water closet, a huge walk-in shower, soaking tub and a large customized walk-in closet. Adjacent to the master bedroom is an exercise room, but it could also be a second study, a nursery or an additional bedroom. Two additional bedrooms and two baths are also on this wing of the first level. The second level, which is an addition to original footprint features a large study/media room which could also be a second master suite and features a large walk-in closet, large bath with walk-in shower, custom built-ins, a wet bar, private balcony and direct walk-in attic storage access. An additional bonus room over the garage is currently a den, but could be an additional bedroom, an ideal playroom, office, hobby room or storage. Renovations to the original floor plan of the home include a $250,000, 1,300+ square foot addition in 2014, a $100,000 face lift and refresh in 2018, including painting of the exterior, freshly painted interior, new lighting, updated baths, cabinetry, flooring...the list goes on and on! Enjoy relaxing on the large screened lanai, with covered patio area, sparkling pool and spa, all overlooking the lake and golf course. This beauty is a MUST SEE! It truly looks and feels like brand new! Don't let the age of the this home fool you....it's very current and just gorgeous! Note: Dining room chandelier does not convey. Note: Video/Audio Surveillance on Premises.